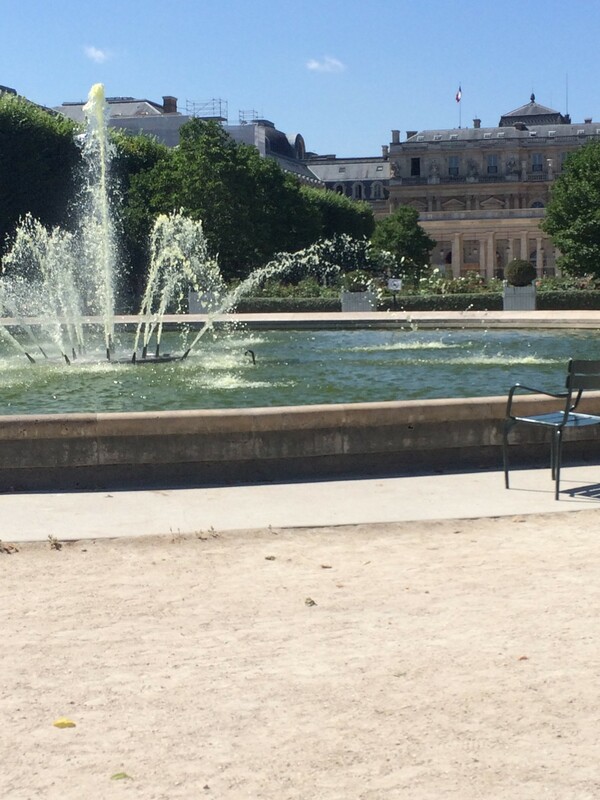 As we professors wait in the Charles de Gaulle Airport for our students’ plane to depart, we reflect fondly on the past weeks’ activities in Paris. 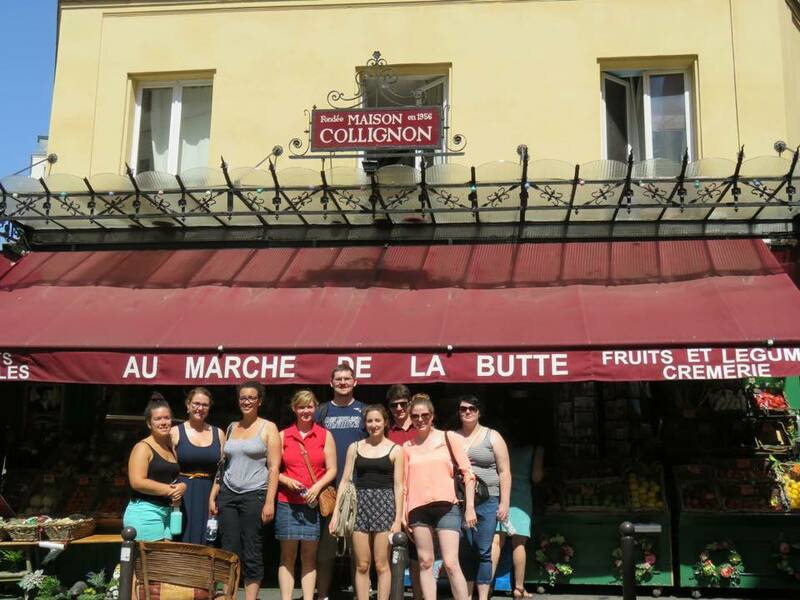 We have come to better know students both familiar and new to us as we have shared many and diverse experiences in the City of Light. 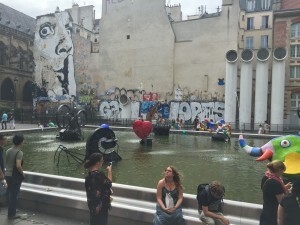 It is always amazing to see the transformation of young adults as they encounter other cultures and lifestyles, and, by extension, it is rewarding to observe the personal transformations and self-discoveries that only a full immersion program such as UMass Lowell in Paris can encourage. The complementary backgrounds of our personal trajectories (Prof. Salmon as a native française and Prof. Cadero-Gillette as a Francophile and former ex-pat) have both shaped the program design and choice of activities. 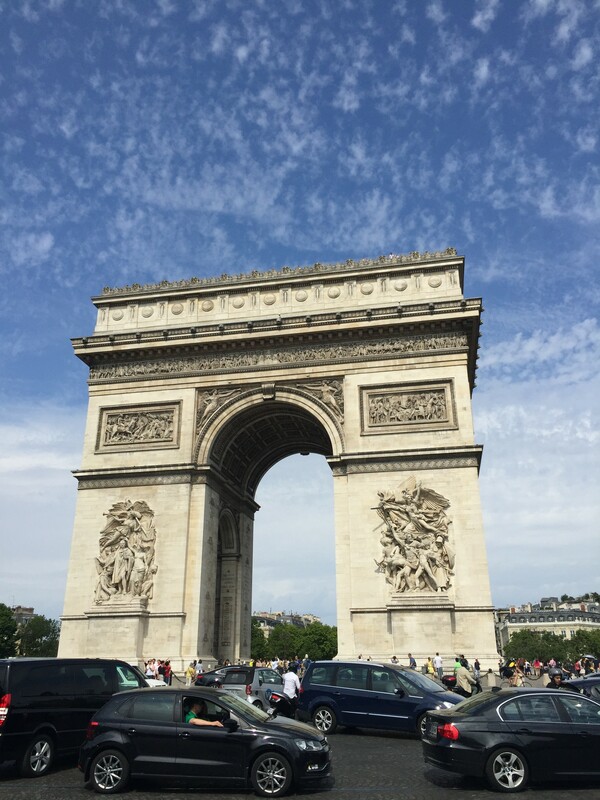 Our mutually complimentary viewpoints also aid in allowing our students to experience the city of Paris in a multi-faceted and complex way. 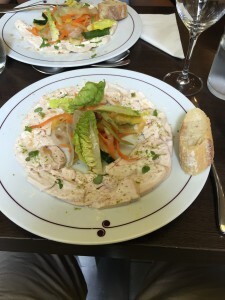 From the Louvre to the Cinémathèque, from haute cuisine to cabaret and street art, we have traversed the city and its many delights in the fashion of Hemingway’s moveable feast. We trust, as this group of students continue their strolls through life, that this summer’s sojourn in Paris will remain with them and inspire them to continue to explore and savor all that the world has to offer. When we started this trip, we were leaping into the unknown. None of us knew each other, some of us had never been to Paris before, not everyone spoke French, and not all of us knew the professors. But over the course of 18 days the unknown became more familiar. 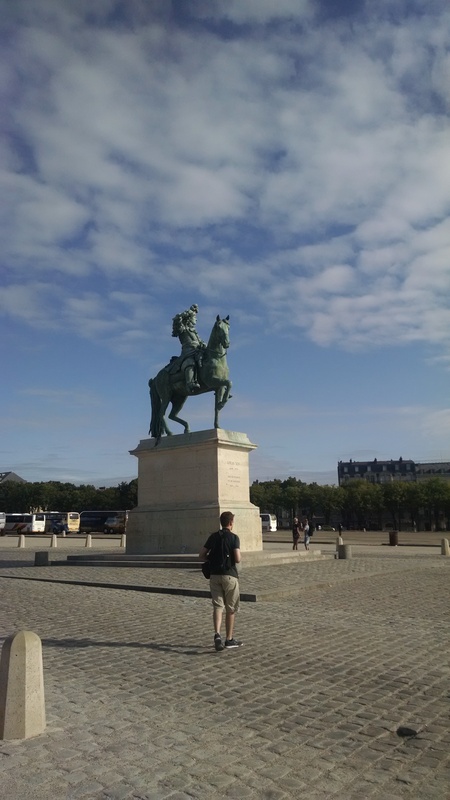 We did not just learn new things about the city and Parisian culture, we also learned a lot about each other. We all came from different backgrounds, majors, family dynamics, towns, and were a diverse age group. The only thing we had in common was our three week trip to Paris. From sharing meals to traversing the city together, we grew closer, forming bonds that will last much longer than the short amount of time we spent here. It all started hanging out on the lawn behind the International House at the Cite U. We would lay out on blankets and talk until the late hours of the night. From there we only grew closer through our long walks across Paris, crowded metro rides and our much needed extended lunches. We quickly found that the students who just days ago were strangers were now some of our closest friends. Even when we split up into smaller groups, we were never disappointed with who we ended up with. 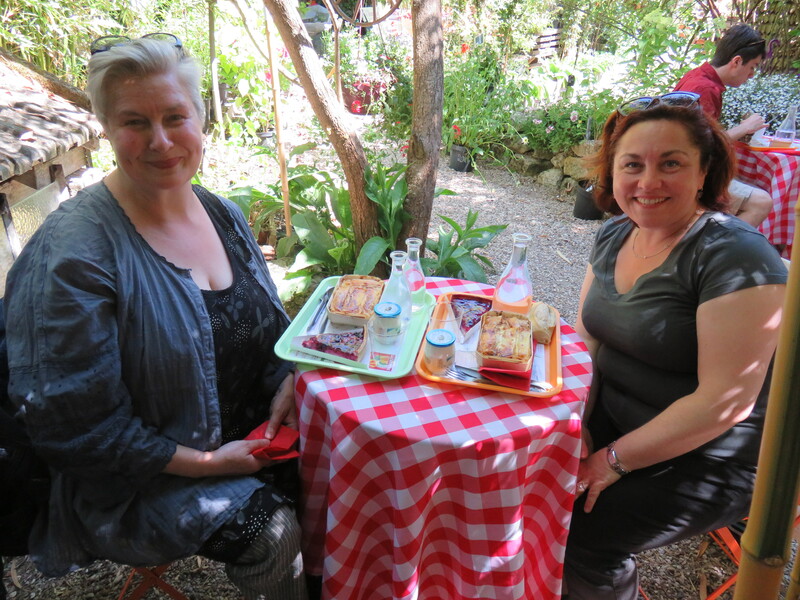 We bonded over trying Turkish street food and a variety of different cafes. Most of all, we looked forward to eating dinner together as a whole group to share the day’s experiences. It didn’t take long for us to start planning our reunions in the US. 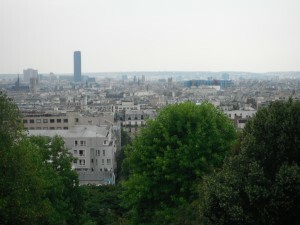 Despite coming from different backgrounds, we shared new experiences and formed a group idea about the city of Paris. 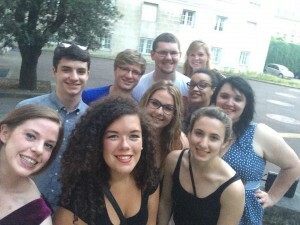 If any of us ever make it back to Paris, it’ll never be as sweet as this trip when we were all together. We miss our families back at home, but going home means we’ll miss our UML in Paris family. We started off as ten strangers but left as ten friends. Today we spent the day is Versailles. It was really cool to be able to compare other once royal palaces such as the Louvre to Versailles. The mere size of Versailles, let alone the beautiful decoration and architecture, made the other palaces look like the homes of commoners. After walking through the castle were were able to stroll through the gardens and briefly experience what life was like as 18th century royalty. Versailles castle from the front entrance. I love the French flag in this picture. 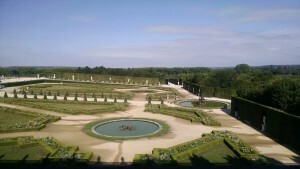 A view of the gardens from inside the castle. Statue at the main entrance. 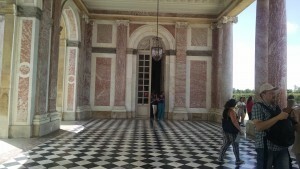 Beautiful pink marble at the Grand Trianon. The Hamlet, where Marie Antoinette escaped the pressure and responsibility of being a queen and enjoyed a royal and lavish version of farm life. 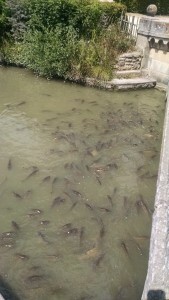 We found a swam and a swarm of fish! We were fortunate enough to get to spent July 14, Bastille Day, in France! 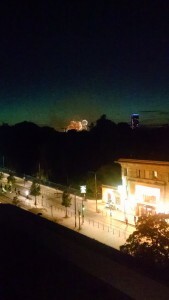 Originally we had thought we were going to miss the fireworks by the Eiffel Tower because the metro stations would close and we had no way back to the Cité Universitaire. Being disappointed that we would miss the fireworks, we took matters into our own hands and sought out a local spot with high elevation. We climbed to the top floor of the United States house and found that we were able to see part of the Eiffel Tower. Excited, we gathered around to watch the show, then the director of the US House showed up. At first we were afraid she was going to ask up to leave and we would be unable to see the fireworks. To our surprise, she unlocked the door to the roof and suggested we go outside for an even better view. 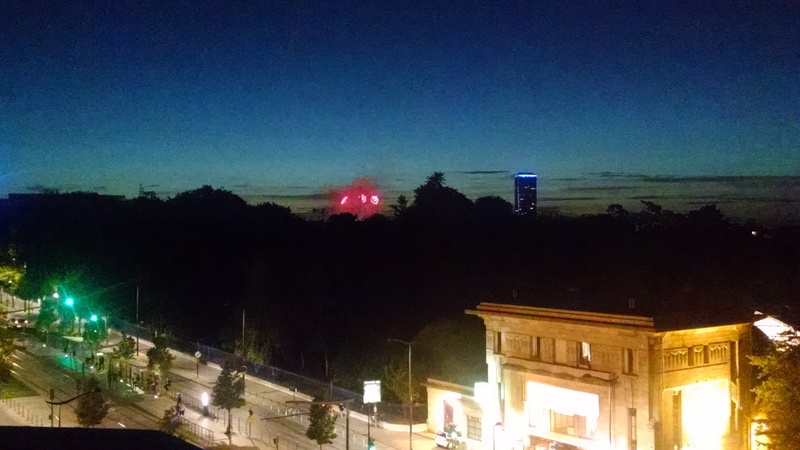 From the roof we were able to watch five separate firework shows across Paris. The experience was truly amazing and the view was breath taking. The pictures below don’t do it justice. 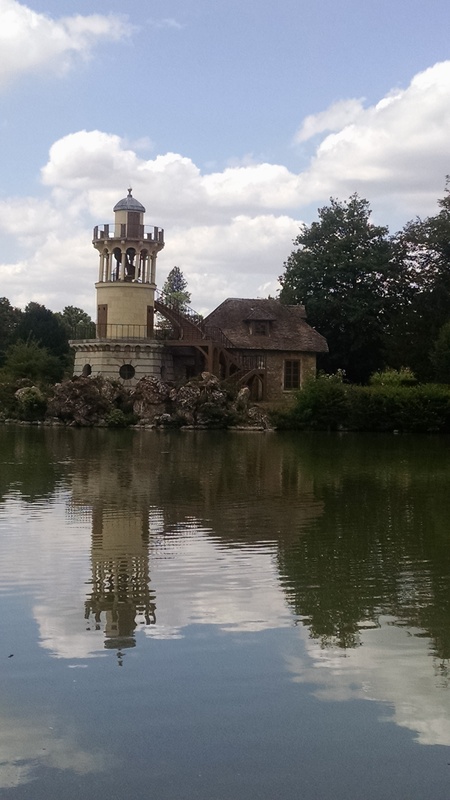 Today we took a beautiful trip to Monet’s house and gardens. The day began with a ride on the RER a train ride to Giverny and then a 15 minute bus ride to Monet’s house. Upon arrival we were immediately greeted by the quiet and beautiful countryside. Being from a small town myself, the birds were a welcome change from all of the exciting but loud city noises we have been experiencing so far. The bus ride dropped us off in a beautiful little area that held some small cafés and gift shops. The first thing that we did was search for a good place to have lunch. We quickly settled on a café that held tables surrounded by bamboo, giving the dining area a relaxing and shaded atmosphere that everyone loved. After lunch we met our lovely tour guide, Ariane. 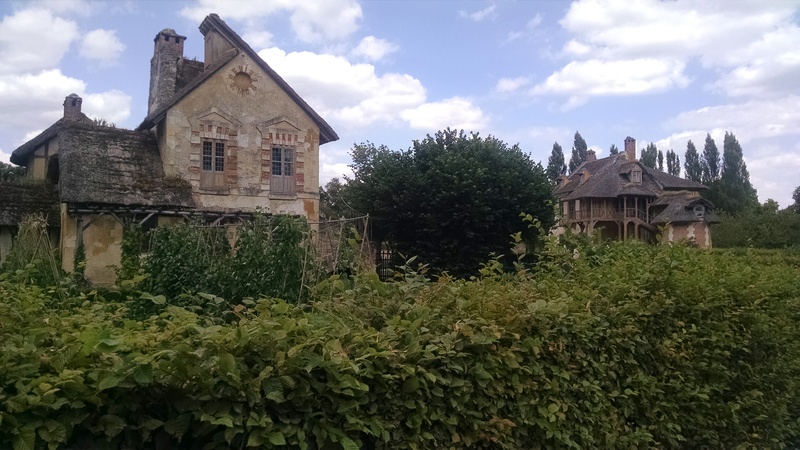 Her extensive knowledge on Monet and his gardens, her sweet dispostition and beautiful french accent made the tour even more enjoyable. 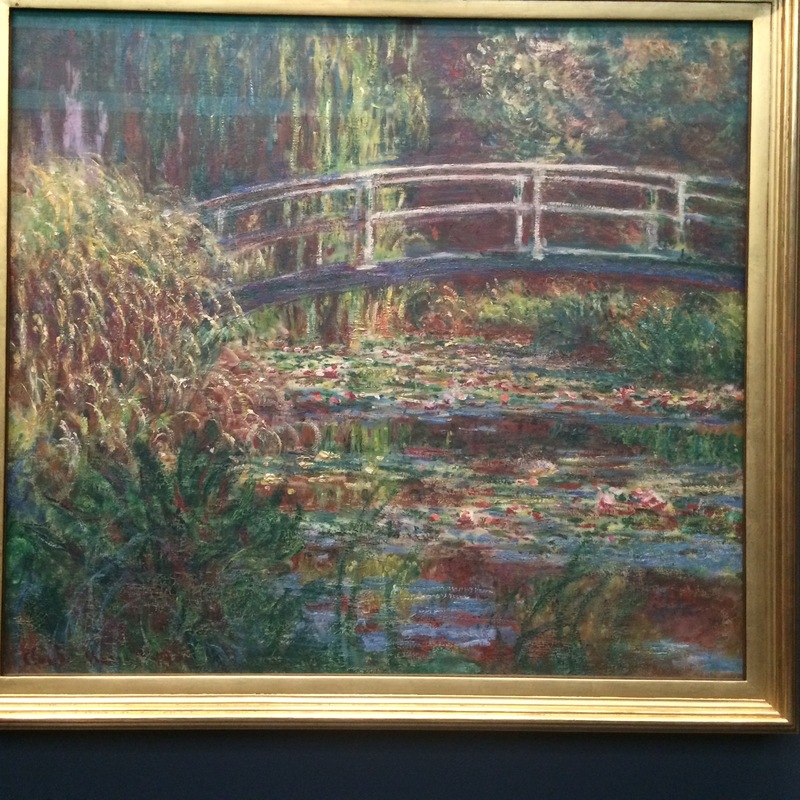 She first showed us the lily pond garden where Monet painted his most well known works. This area was meticuolusly maintained, full of shade and has quickly become one of the most beautiful places I have ever seen. Then we toured the his other garden which was just as beautiful as the other but had a more organized nature and much more sunlight. After touring both gardens we toured through Monet’s house which was very beautiful and decorated with his favorite (and also mine) color combination: blue and yellow. Upon finishing the tour we thanked Ariane and then waited for our train by getting some ice cream. Then we procceeded to take the bus, the train and the RER back to the Cité. Today was definitely my favorite day so far but I know we have more beautiful experiences coming our way and I cannot wait! 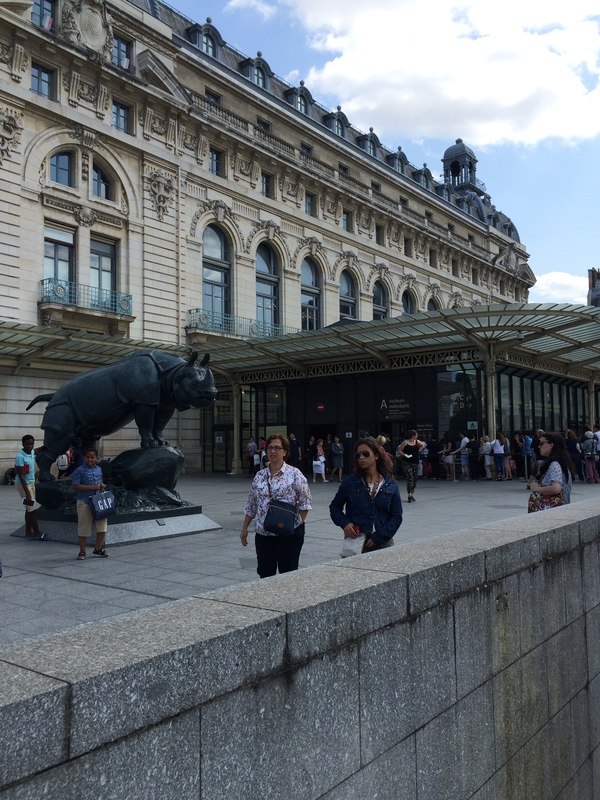 Today we spent the day at another museum- Le Musee D’Orsay. It was much less crowded than the Louvre and had Impressionist style paintings. 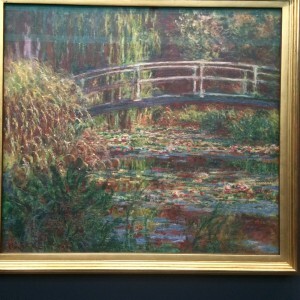 Claude Monet’s work was beautiful and I loved the bright colors he used. We also saw many paintings done by Van Gough, Manet, Courbet, Renoir, and others. We learned that many of the artists had phycological problems but it resulted in the works we saw today. We also learned about the importance of certain paintings and their role in history. For example, Manet’s Olympia was rejected by the audience because of how it portrayed women. It was interesting to see how all the little details in Olympia had a deeper historical meaning and that they’re meant to portray a certain message to the viewer in that time period. 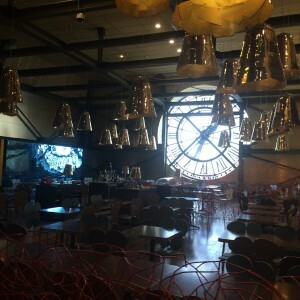 We had lunch at a beautiful cafe in the museum (pictured below) and ended the day with a movie about one of the painters we saw in the museum- Renoir. I can’t wait to see what next week will bring! I am quite frankly devastated. I took a bunch of lovely photos with my phone but I cannot transfer them onto this blog, unfortunately. 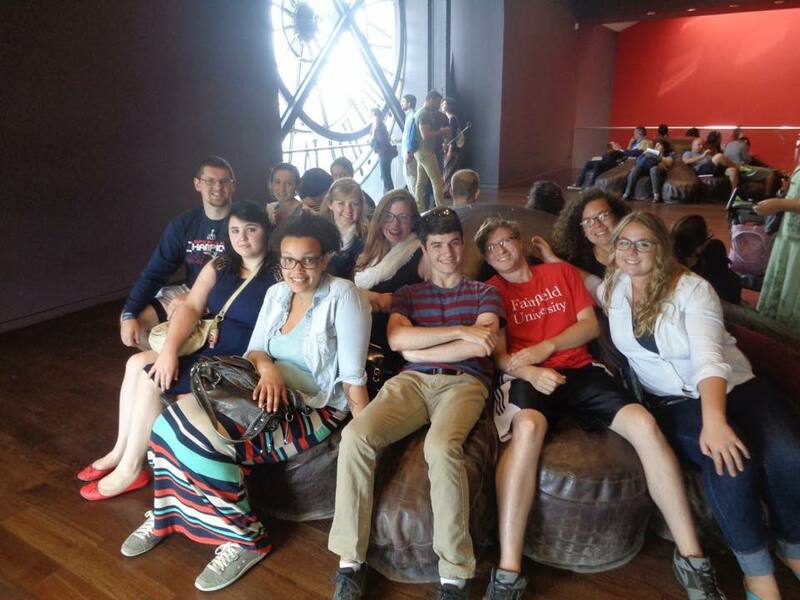 The group met at 9 AM and we made our way to the Louvre and ultimately to the Musée du Louvre. I took photos of the glass pyramid and the lovely architecture of the older building. We went in through Pavillon Richelieu which not only reminds me of the Cardinal but growing up I only knew who he was because of Michael Palin from Monty Python. I took a photo of the doorway so the child in me can reminisce. The first thing inside I photographed was a statue of Mercury, because I love mythology. Next I snapped one of the painted ceilings because as I keep telling everyone (which is probably annoying by now) that I have been in Italy last year and this entire museum trip brought me back to Rome, Venezia, Milano and my primary stay was in Firenze. Needless to say the painted ceiling was one of the many things that reminded me of how every day was a new lesson of Renaissance Italy only now everyday is Renaissance-19th Century France. It was not surprising to me that in the palace where the King lived there were extravagantly decorated rooms. Anyway we went through the different trends of home decor from the dark fabric’d walls to light Rococo designs. I had no idea where that style got it’s name, needless to say I was shell-shocked. 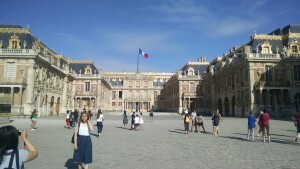 Seeing Marie Antoinette’sroom was no surprise by the way. It was light and feminine and exactly how I would picture her room. Anyone familliar with the Renaissance era knows that there are many references to Ancient Rome or Greece. Mostly from what I see of France and Italy usually any Gods depicted take the Roman form but I was pleasantly surprised that Valerie D’Apollon took Apollo’s Greek name. He’s my favorite God too! Next on my slideshow I would have added is a hilarious train of Mona Lisa attempts. 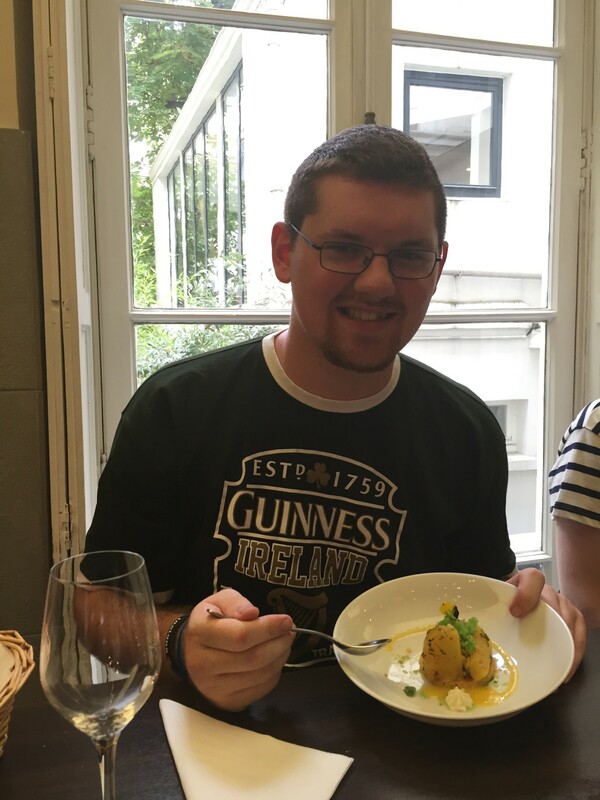 I have seen the Last Supper in Milano, I have even went to the town of Vinci- taking a class on Leonardo da Vinci in Florence last year brought me great opportunities. But I have never seen his most famous piece until today’s La Gioconda, La Madonna Lisa. The French call it La Jaconde and Anglophones call her Mona Lisa or Monna Lisa. Was it worth the stampede? For me it was. I’ve written essayson Leonardo da Vinci, I’ve even displayed him from a video game (Assassin’s Creed II). I’m not saying I’m entitled to the painting I just thought that it was an obligation for me to finally see it. 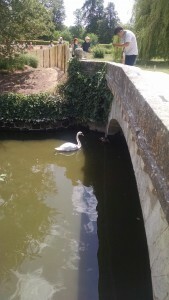 And it was hard….. I have enjoyed every other piece as well. Learning all the stories were really interesting. For lunch break, I immediately had to accommodate the needs of a certain organ I inherited genetically on the small side so I bit the bullet and coughed up a €1 coin for a toilet. Which cost me 15 minutes of valuable 1 hour we were allotted for lunch. Since fast food in Europe is over all better I always like to try overrated chains at least one. Today was the day I tried McDo’s. To wrap things up, after lunch we continued through the maze of the museum much like we did the entire day- we would stop at an important and amazing painting and go over the background and history of not only the specific artwork but also the artist themselves. I was very fascinated by all the knowledge I’ve accrued! This morning we met at 10 A.M. and took the metro to the Arc de Triumph. It was much bigger in person than I expected, And the view from it down the Champs Elysees is beautiful. We then strolled down the Champs Elysees and made our way to the cooking class we had at one of Guy Martins restaurants. We all put on disposable aprons and made our way to our stations. Our teacher, Francois, was very polite and showed us how to do everything. The meal was fantastic, and it was great to eat something I had helped make, as I do not often cook. Thankfully, it was still great even with my lack of experience. We also had the option for a dessert for 6 euros, which i happily paid. We went back to the Champs Elysees for some shopping, and then we visited the Centre Pompidou, a modern art museum. 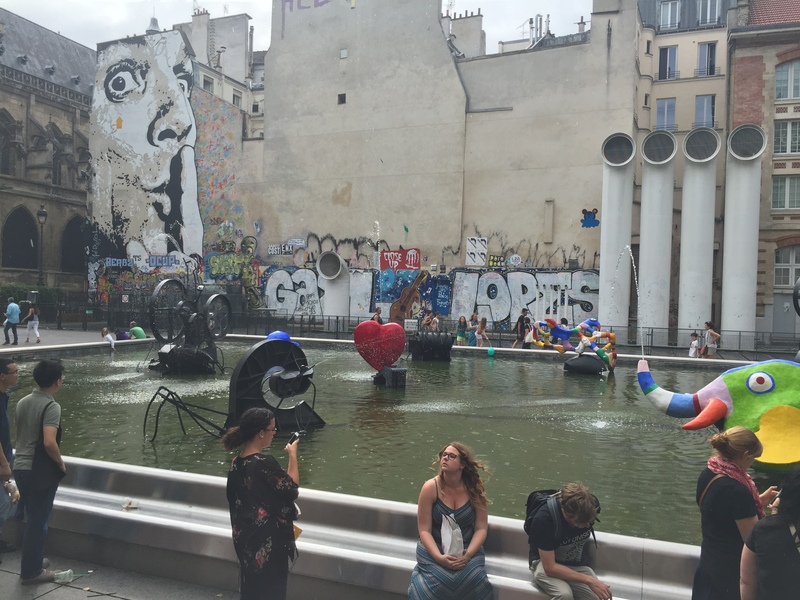 We couldn’t go in because it is closed on Tuesdays, but we did get to look at it and look at the fountain and street art next to it. 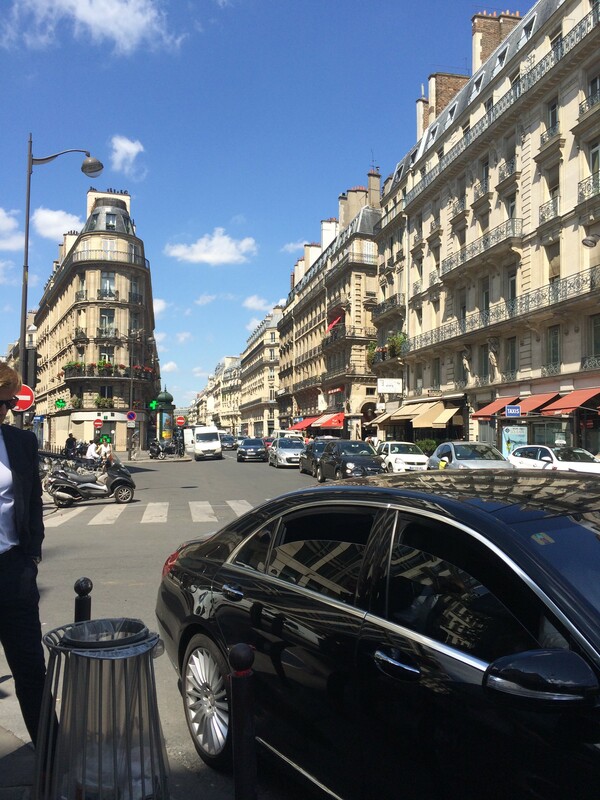 All in all it was another beautiful day in the city of lights. 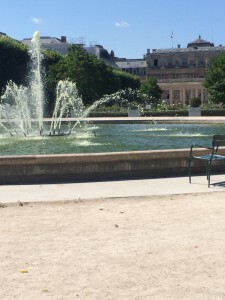 We started off the day with a walking tour of the Jardin du Palais Royal. The tour highlighted the different techniques used in the architecture. We also examined the different styles of the apartments in the city. We learned that through the years apartments went from being a round shape to being more flat. 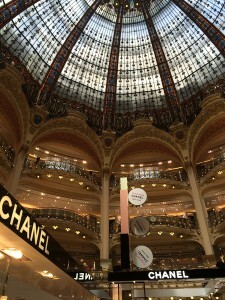 My favorite part of the tour was getting to go to the Galaries Lafayette. This was the first department store in Paris. This department store was a big change for many Parisians. Many jobs opened up,however, many small businesses had to close. The department store was definitely built to impress. The beautiful stained glass windows definitely persuade the customers want to leave with a purchase.